The title of this map is arranged in an ornamental surround in which reclines the figure of Thamesis. 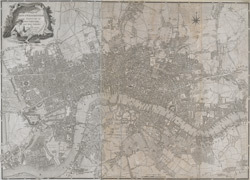 Cross-hatching and stippling are used to distinguish land use, with differentiation made between fields and park land. Hyde Park features prominently on the plan. Deer were hunted here until 1768. It was also a well-known duelling ground. A particularly protracted and bloody duel was fought in 1772 between a Mr. Sheridan and a Captain Matthews over the honour of a certain Miss Lineley. Reports of the duel appeared in all the papers, scandalising the London public.